Become a “master roaster” by creating your own custom roasting profiles using Sonofresco’s Advanced Definition Roasting (ADR) controller – the perfect combination to make a profitable difference in your business! 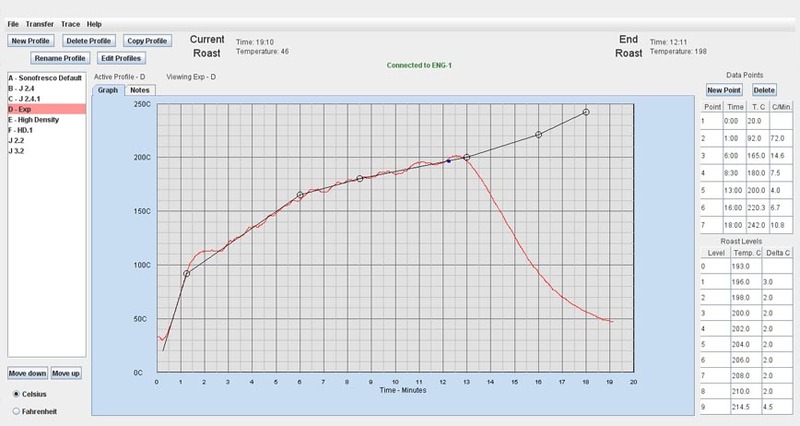 The ADR software package provides a simple and intuitive means of designing time-temperature roasting profiles for different coffees and specifying end of roast temperatures using a laptop computer. Bluetooth connectivity uploads the profiles and end of roast temperatures to the Sonofresco roaster control and monitors the roast profile on the computer screen. The simple push-button control provides consistency from roast to roast. The software package contains the Sonofresco Default profile used on all roasters. The Sonofresco default profile can be copied, modified, saved, and uploaded to the coffee roaster. All 2014 Sonofresco roasters can specify either the ADR control package or the standard control. Upgrade ADR kits are available for all pre-2014 model roasters. The kit includes new control board, new stainless steel temperature sensor, Bluetooth board, and software CD and license. To further develop your roasting skills, we recommend these online coffee courses offered by Boot Camp Coffee.